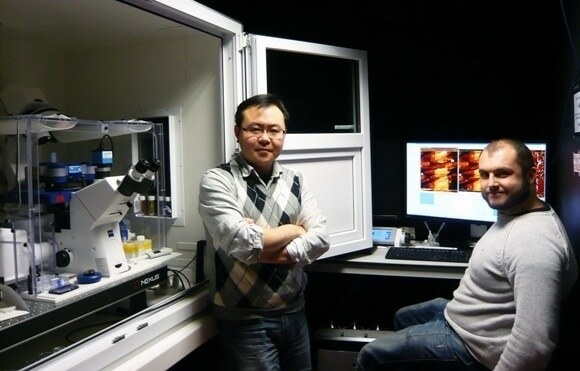 JPK Instruments, a world-leading manufacturer of nanoanalytic instrumentation for research in life sciences and soft matter, reports on the use of their NanoWizard® ULTRA Speed AFM system at the University of Liverpool in the group of Dr Luning Liu of the Institute of Integrative Biology to study biological membrane structures and protein dynamics. Dr Luning Liu leads a research group at the Institute of Integrative Biology at the University of Liverpool. Using interdisciplinary approaches, the Liu Lab aims to explore the molecular mechanism underlying the self-assembly, dynamics and regulation of biological membranes and macromolecular protein complexes. The long-term goal of the group is to understand the physiological adaptation of cellular metabolisms in cells towards environmental stress, and harness the fundamental knowledge to build artificial systems, using synthetic biology techniques, to underpin the development of bioenergy research and metabolic engineering. The Group applies the JPK ULTRA Speed AFM to study biological membrane structures and protein dynamics. AFM has been used to investigate the supramolecular architecture of photosynthetic membranes in bacteria and algae, revealing how photosynthetic proteins are organized and interact with each other and how the membranes are synthesized to optimize the photosynthetic efficiency in nature. In addition, the AFM (located in the Centre for Cell Imaging) is used to explore the assembly dynamics of bacterial microcompartment shell proteins and the formation process of shell facets. This paves the way for unravelling more details of bacterial organelle structure and synthesis, and provides new clues to control the construction of the shell in artificial processes. We use different microscopy techniques, including confocal microscopy, TIRF, electron microscopy and AFM. We pick specific tools depending on our research needs. Thus we have integrated the JPK NanoWizard® system with confocal and TIRF for simultaneous fluorescence and AFM imaging on biological samples.